A new Sacramental Program that Eclipses all others. Australia's newest and best sacramental preparation program is now available. Years in the making, and responding to the specific needs of Australian Catholic parishes and schools, the Becoming Catholic sacramental program has been totally revamped to satisfy the needs of today’s young Catholics and their families. Never before has such attention been given to the specific needs of 21st century learners and their families. √ Engaging reading, activities and prayers reinforce the importance of each sacrament and focuses the child and family’s attention on key spiritual elements. √ Visually stunning Sacramental ‘big books’ enable parishes and schools to capture and hold the attention of children as they convey key information relating to the Sacraments as well as sacred symbols and objects. √ Fosters prayer and Christian dialogue in the home. √ Widens the lens to show children and families how to celebrate, share and most importantly live Jesus’ mission to the world. Review the program before you buy. Check out the features and benefits of Becoming Catholic for yourself. 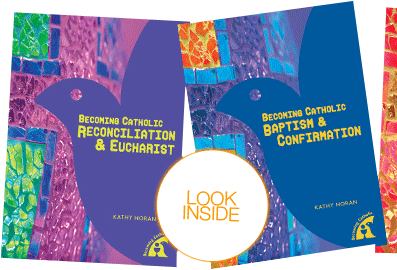 Obtain a Review Pack containing a copy of each Sacramental workbook and the Parents Guide. Cost $29.95. Switch to the Becoming Catholic Sacramental Program TODAY. Provide sacramental preparation and appreciation that will last a lifetime. Provide parents with a valuable tool so that they can be fully involved in the religious development of their children and in their initiation into the Catholic faith. 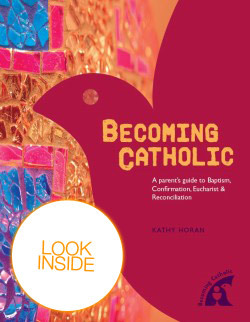 The Parent’s Guide explains succinctly what the sacraments are, the changes associated with the sacraments since Vatican II, why they are such a time of excitement and importance. Also included are explanations about the mass, definitions of important words and phrases and a number of everyday and important prayers. Give sacramental candidates and their families the tools to celebrate the sacraments, to come together as a family unit and to fully realize their place as members of the Catholic community. Each sacrament is supported by a separate workbook. Structured to enable the candidate and family to work together, each workbook is divided into themes, each containing a meaningful Scripture passage, Family Reflection Time, Prayer Time and Activities for the whole family. Grab and maintain your students’ attention as you assist them to prepare, celebrate and live the sacraments. Commence Christian dialogue with young children. 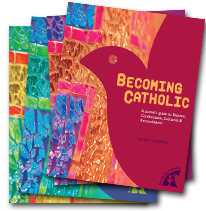 Support children’s preparation for the sacrament of Confirmation by assisting them to understand the sacraments of Baptism and Confirmation and what it means to receive them. 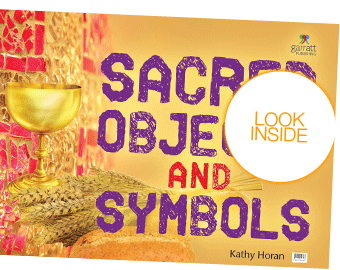 Delightfully explain the Catholic sacred objects and symbols with this visually stunning Big Book. Vibrant photographs and age appropriate words clearly describe the major objects and symbols used in the Mass and seen in church. Lesson Planning made easy: Bonus teacher resources come with all Big Books. Kathy Horan has worked extensively in a range of leadership roles with Catholic Education in S.A. Kathy holds Masters Degrees in Theology and Educational Leadership. A focus of her work is family-based Catechizes, particularly in the area of sacramental preparation. She enjoys working with families and supporting adults in their ongoing faith formation and understanding of their primary role in sharing their faith with their children.